The third instalment of Gameloft's Asphalt series- "Street Rules". It is a racing game that was released in 2006 on Java-based mobile phones and in 2007 on Non-Java based mobile phones. It is the first mobile game to be played at the World Cyber Games competition. 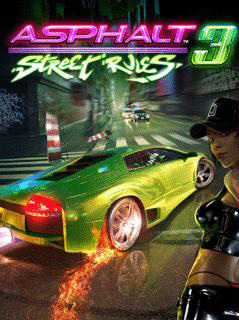 The gameplay consists of an "Instant Race" mode where the player is placed at a random city's race with any one of the cars he has bought; and also a "Career" mode, which is the heart of the game. The player starts with a Mini Cooper S, and has the option of unlocking 11 other sports cars and bikes, each with their own tuning, during his quest. The initial game ends when the player has finished all of the races with a podium finish. The final end comes when the player has achived a 'Gold' in all of the events, and is thus declared the best in the 'underground racing league'. Even after completing the career mode, the player can still take part in any of the events, thus increasing his cash balance. *Race: Where the player starts from the bottom of the grid and competes against seven other racers, with the main objective of finishing 1st at the end of 3 laps, while avoiding police cruisers and road blocks. *Duel: An "One-on-One" race where the player must catch up with his sole opponent, and overtake him to finish 1st at the end of 2 laps to win. *Beat'em all: In this mode, the player's objective is to Crash a certain number of rival racing cars or police cars before the end of 3rd lap. *Cop Chase: This mode features the racer taking the role of a cop, and with the objective of crashing the boss racer, without harming the other racers and the civilian cars. The player starts with $30,000 cash, and every time he commits a "collateral damage", he is deducted of a certain amount of money. *Cash Attack: This mode is similar to the normal race, except with the added objective of earning as much money as possible, through illegal acts like Drifts, Overspeeding and Takedowns. *Sandra: "Take me with you, and I'll boost your car!" *Michelle: "Choose me, or you'll have other cops on your tail!" Julia: "Let me come, and you'll be on Prime Time!" Overall, this is the ultimate racing game of the time, miles ahead even of its sequels Asphalt 4: Elite Racing and Asphalt 5: Nitro Rush. With excellent gameplay throughout, Asphalt 3: Street Rules is bound to keep you hooked for hours at an end. Until next time, Watch your back folks, for it leads straight to your a**!